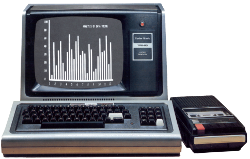 Will convert a CAS file into a WAV for making a real TRS-80 cassette. 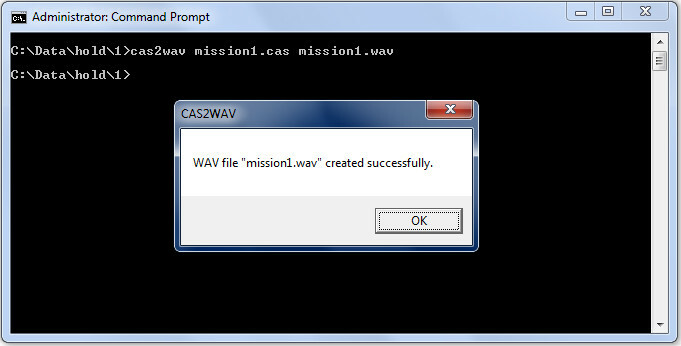 Wav2cas is a Windows program, run in a DOS window (or you can use drag’n’drop, dropping the wav file onto the wav2cas desktop shortcut icon), which takes an uncompressed Windows wav file (made from a Model I Level II (500 Baud), Model I Level 1 (250 baud), or Model III (1500 Baud) cassette tapes) and generates a cas file for use by TRS-80 emulators. Silent bits doesn’t matter, so an entire tape can be converted (but header synchronization is only done once, so this is risky). 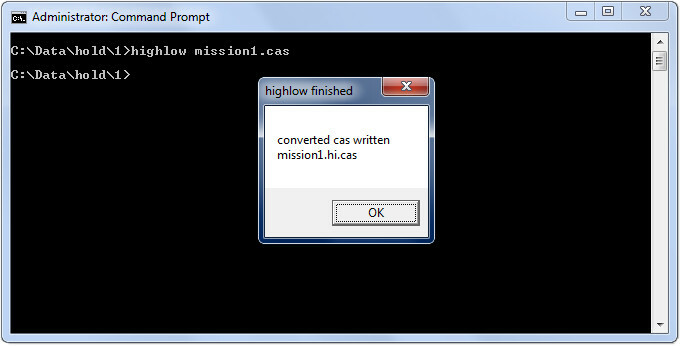 Highlow is a small utility for converting CAS files between Highspeed (1500 Baud) and Lowspeed (500 Baud). 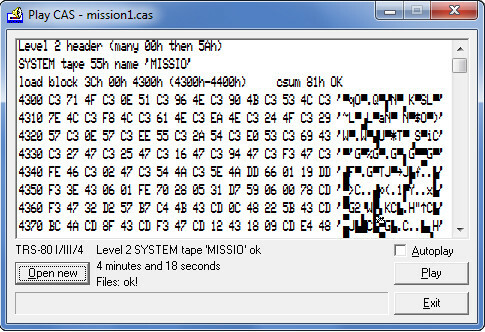 Since 1500 Baud includes a startbit, making the file contents unreadbale, it is useful for viewing the contents of a highspeed CAS file after a wav2cas_h conversion, to do a preliminary check for success or to get the name from a system tape. It can convert both ways and does so automatically. It can’t handle multiple files in a CAS file so only single content CAS files may be used, and it must detect the header so it can’t deal with fragments. 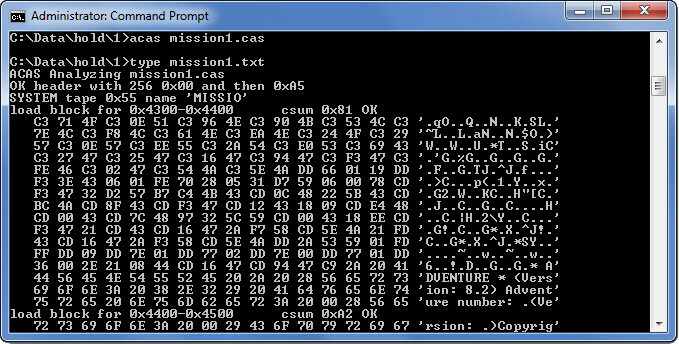 ACAS is another small utility, this time for checking the cas files. Actually it is a beta as it will be incorporated in another program but I decided that I would release this standalone version anyway. As it is now it will scan through a cas file and find out what it can about it and output what it thinks to a txt file with the same path and name. ACAS will read model I and III type of CAS files, it will attempt to decode the first program it finds, if there are data after what it perceives as a program these will be listed as hexcodes. For highspeed it will check that the startbit is ok. 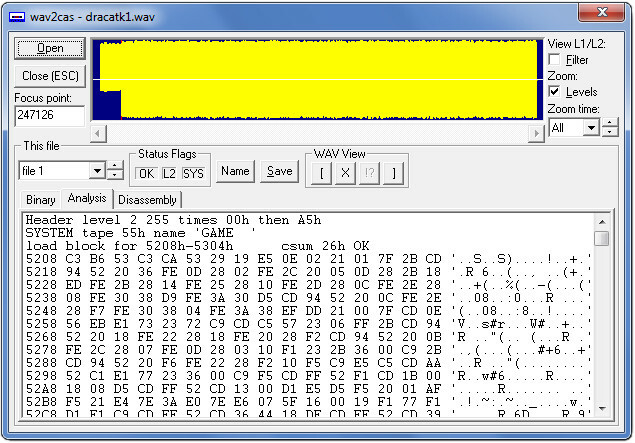 It does SYSTEM tapes, reporting the blocks, does the checksum, looks for gaps. It does BASIC, listing the program detokenizing all except what is in quotes or behind a REM, checks the embedded addresses, reports any codes in quotes or behind REM. 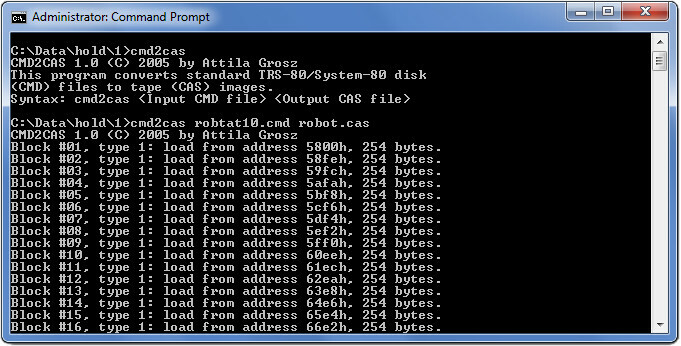 Will convert a /CMD file into a WAV for making a real TRS-80 cassette. 2.0 May 2018 Knut Roll-Lund. Use your PC as a cassette player for your TRS-80 Model I/III/4 Level I and II by connecting your TRS-80 cassette input (“Ear” Output) into the PC’s headphones output. Supports Level 1 (250 Baud), Level II (500 Baud), LNW (1kHz), and Highspeed (1500 Baud) and SYSTEM, BASIC, EDTASM, LEVEL 1 SYSTEM, and LEVEL 1 BASIC files. It does NOT support Scripsit, or ASCII files.